My friends and family will tell you that when it comes to pasties I am a bit of an obsessive. I don't eat them left, right and centre, but when I do buy one I expect it to be in the correct form. Since moving to Newcastle, I've been to countless bakeries and shops that try to pass off lattices filled with meat or cheese and onion as pasties. I tell you now, pastry stuffed with some kind of filling does not a pasty make! If you have never been to the South West, I urge you to go and buy a pasty from one of the regional bakers such as Oggy Oggy Pasty and then return to your local 'pasty' shop - you'll see why I'm so obsessed with this issue! Until recently, I didn't even know that it was possible to ruin another of my South West food favourites, the cream tea, but a recent visit to a National Trust property showed me otherwise (why would you pair scones and jam with whipped cream, anyway?!) Luckily, this month's Best Of British challenge is set in Dorset, so I can set those crazy Northeners straight! Until Karen of Lavender and Lovage, this month's host, mentioned cream teas in her post I didn't actually know that cream teas were a Dorset tradition too - it's obviously been eclipsed by the Devon-Cornwall 'whose method is better' debate - but knowing this has given me an excuse to bring out the clotted cream. With cream teas on the brain, I couldn't deny myself this cake. The idea came to me in a moment of genius, and, despite having a half-formed idea for a cake involving some Dorset Blue Vinny, once I had it in my mind all my other ideas for this challenge went out of the window. This Cream Tea Cake has strawberry jam and clotted cream sandwiched between two plain sponge cakes, topped with pieces of scone. I might put more scone dough on top next time (and there will definitely be a next time! ), as it looks like I'd had a bit of a cake disaster. Luckily, a dusting of icing sugar pretties it up again. I did consider putting tea flavouring into the sponge, but I don't think anyone really drinks their inclusive tea whilst they still have a mouthful of scone, jam and clotted cream (and I'm not really a fan of tea anyway), so I stuck with my original plan. Even if you've never even heard of a cream tea (you poor thing), I urge you to make this cake. I tried a piece when it was still slightly warm, and it tasted divine. The scone topping really comes through and combines with the filling in your mouth to give a true cream tea feeling. Preheat the oven to 180C/160C and line two cake tins with parchment paper. Put 10g of the butter, 15g of the sugar, the plain flour and 1/4 tsp baking powder in a mixing bowl. Use the tips of your fingers to rub the butter into the dry ingredients, then roll into a dough, adding a little milk if necessary. Place to one side. Cream the remaining butter and sugar together in a bowl until light and fluffy, then beat in the eggs. Seive the self raising flour and remaining baking powder into the batter and fold in. Add the milk and fold in to give the cake a soft dropping consistency. Divide the batter between the cake tins, then place in the oven. Bake in the oven for 10 mins, then break the dough into pieces and sprinkle over the top of one of the tins of batter. Continue to bake the cakes for another 12 minutes, or until a skewer comes out clean. Allow the cakes to cool, then place the one without the scone topping on a plate and spread the clotted cream over it. The clotted cream will seem almost solid at first, but will soften immediately upon breaking its surface. Put the jam in a bowl and stir until it takes on a more spreadable consistency, then spoon on top of the clotted cream and spread so that it covers the cake evenly. Finally, place the cake with the scone pieces on it on top (scone pieces facing up). Dust with icing sugar if you like. 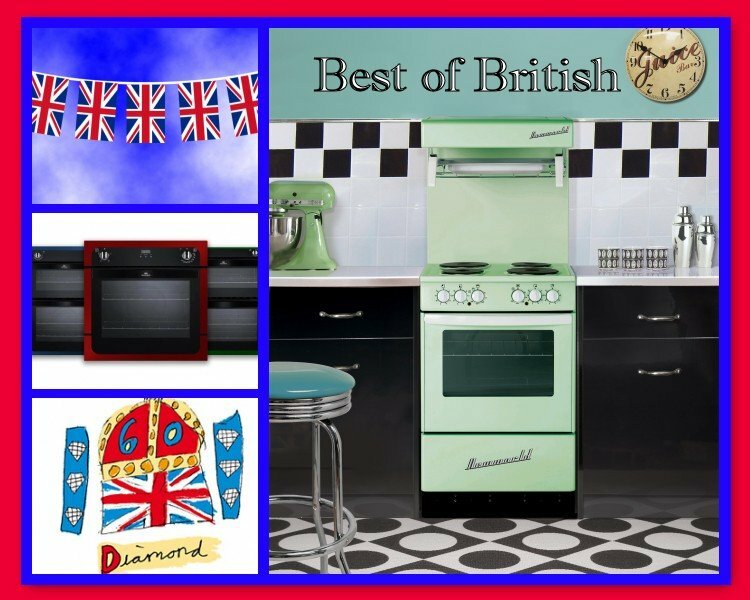 Best of British is a monthly challenge that is being sponsored for the first six months by New World Appliances, fronted by Fiona at The Face Of New World Appliances. At the end of those six months, the entries are all judged by an as-yet undecided person and the winner gets £100 of Amazon vouchers. I'll be back at the start of next week with a tasty breakfast snack. See you then! This sounds and looks delicious and very unique. I need to give it a go.